A better candidate experience through uniformed online applications and timely automated correspondence. The power to effectively report on recruitment related activity. So why is it that many companies and recruiters “fail” to utilise the tools they have paid for and are paying for? How smarter use of the ATS would be beneficial. Every role, in every organisation has some requirements that the ideal candidate will possess. From the moment you take a job brief, you should know what these requirements are. After all, if you are reading the C.V you are looking for some criteria to match your suitable candidates against. If using set criteria, you are not finding candidates that meet the muster – most good ATS will allow you to reassess and redefine your criteria. 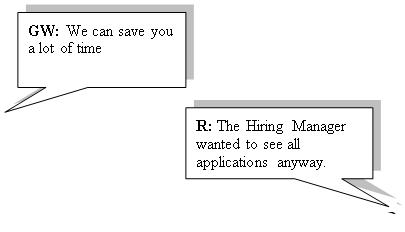 Ask any recruiter that has that one serial applicant what they would give to not have to reject them for the 300th time. – now, give that same recruiter their 1st born back. You will never get rid of all the candidates that believe stretching the truth and applying for roles they aren’t suited to would be a good way to get an interview. A combination of clear and concise criteria when advertising the role along with equally well written and pertinent questions has shown to reduce the number of unsuitable applicants. EuroBrussels.com (the European Affairs Jobsite) has some good information here regarding putting a job advert into words to discourage the time wasters. 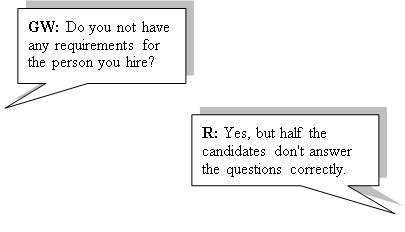 Even if the above recruiter was correct, – that half the applicants do not answer questions or fill out applications correctly, that same thought dictates that 50% do. Sure, the top few scorers may include embellishers, you would assume that a skilled recruiter would pick this up. This is less about your ATS and more about your process and relationships in the business. Statements like this are a sure justification for redundancy. It is a sheer exercise in time wasting to receive 10, 20, 30, 100 applications, read each and every one of them and then pass the same 10, 20, 30, 100 files to a busy hiring manager to read also. 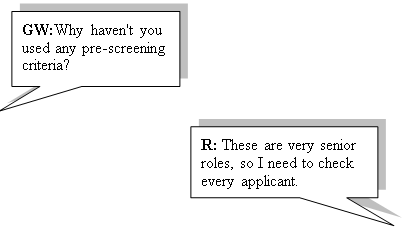 Why is the recruiter involved in the process at all? Relationship building here is key. Ensuring that the recruitment team and the hiring manager are on the same page when taking a job brief is paramount. Agreeing with the hiring manager, how adverts are to be written, what criteria will be screened against and keeping them informed will go a long way to ensuring the best possible experience for all concerned. Hiring Managers may be the experts in their fields, but good recruiters are experts in theirs. Gaining a Hiring Manager’s trust that, based on the criteria set, they will only have to deal with a fraction of the applications that they currently do and educating them on good recruitment process benefits everybody. Candidates will be happy as effective recruiting promotes a quicker response and faster hiring/rejection process. Recruiters will be happy as they will be recruiting more and dealing less with administration. Recruitment Managers will be happy as the recruitment statistics and KPIs will improve. Hiring Managers will be happy as they will only receive “good”applications. Your systems administrators will be happy as you are now using the system in a more effective manner. Isn’t it nice to dream of the Perfect World?